Being an Executor from People's Law School is for people who have been appointed as executor in a will. 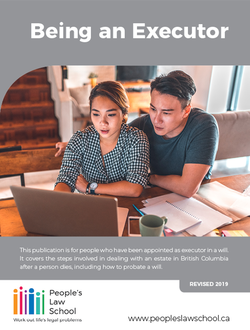 It covers the steps involved in dealing with an estate in British Columbia after a person dies, including how to probate a will. The information reflects the Wills, Estates and Succession Act, which became law in 2014. Being an Executor © People’s Law School is, except for the images, licensed under a Creative Commons Attribution-NonCommercial-ShareAlike 4.0 International Licence. At People's Law School, we believe accurate, plain English information can help people take action to work out their legal problems. This resource explains in a general way the law that applies in British Columbia. It is not intended as legal advice. For help with a specific legal problem, contact a legal professional. Some sources of legal help are highlighted in the "Where to Get Help" section. This page was last edited on 21 March 2019, at 15:47.